Belfast-born mezzo-soprano Laura was educated at Methodist College Belfast, and went on to study music at Leeds University. During her time in Leeds she was a choral scholar at Leeds Cathedral, and after graduation went on to become a Lay Vicar at Christ Church Cathedral, Dublin. Laura sings with several Irish choirs including Resurgam and Sestina, an exciting new choir run by fellow alto Mark Chambers! Laura recently moved to London and enjoys performing with various ensembles there including, Britten Sinfonia Voices, London Voices, Philharmonia Voices and Polyphony. Laura performs regularly with her accompanist Miles Lallemant (another Chamber Choir Ireland alto) in recitals in London and abroad. 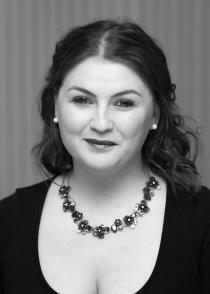 As an oratorio soloist, Laura has worked with various directors including Judy Martin and David Hill; she is a featured soloist on discs directed by Eamonn Dougan, Nigel McClintock and Paul Hillier, and has appeared as a soloist on Last Night of the Proms and BBC Radio Ulster Sounds Classical. Recent solo engagements include Rossini’s Messe Solennelle with Axminster Choral Society, Verdi’s Requiem with Dublin University Choral Society, Dvorak Mass in D and Kodály: Missa Brevis with Ealing Choral Society, and Mozart’s Requiem with Armagh City Choir.